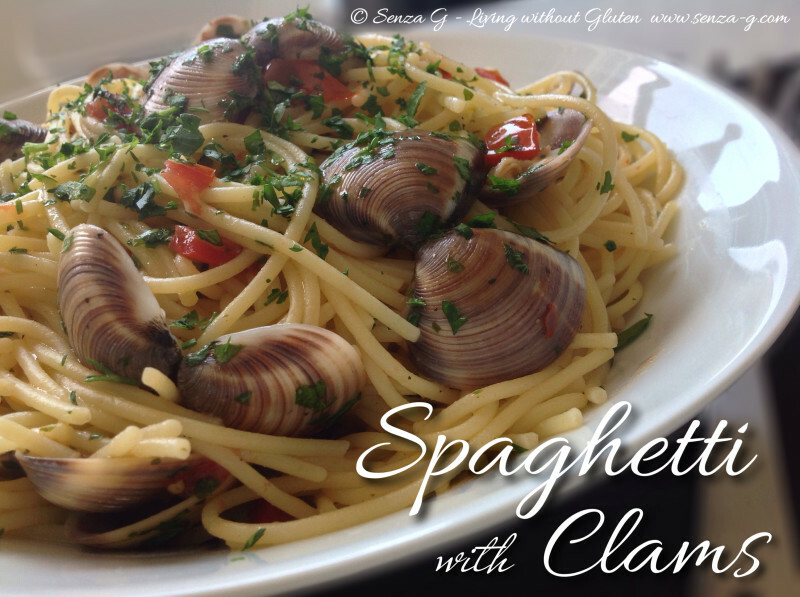 Mmmmm … there is nothing better than a lovely Spaghetti alle Vongole (Spaghetti with Clams) in summer! Being Celiac or Gluten Intolerant need not change that! The sauce ingredients are all gluten free anyway, we just have to use gluten free pasta! This is my version, slightly different than the usual versions, with the addition of anchovies and some fish stock powder which I feel intensifies the taste. If you do not find fresh clams, you can use frozen ones in the shell instead. Start by cleaning out the clams, rinsing out the grit until water runs clear. Put the clams, the white wine, a minced garlic clove, fish stock powder, few parsley stems, salt and pepper in a pan, cover and cook for a few minutes till clams open. Discard those that do not. Strain the cooking liquor. Meanwhile, cook the gluten free pasta. In a medium saucepan, heat the olive oil, add the remaining minced garlic and chilli flakes and cook for about a minute. Do not allow the garlic to brown as it will taste bitter. Add the chopped anchovies, the diced tomato, followed by the reserved cooking liquor and bring to a boil. Reduce the heat and add the clams and the chopped parsley. Shake the pan to ensure even heat distribution. When pasta is al dente, drain, but reserve a cup of the pasta water. Add the spaghetti to the pan with the sauce and mix well but gently as gf pasta breaks easily, adding a little of the reserved water if mixture is too dry. Place the pasta vongole in a large serving bowl, drizzle with a little olive oil and garnish with parsley sprigs or chopped parsley.